We have developed a logo for National Maternity Voices which can be adapted for use by local Maternity Voices Partnerships. Here are some example logos currently in use by MVPs across England. There are 2 different styles of logo you can adapt depending on the length of your MVPs name – long or short as well as a circle version of the logo for social media profile images. Please ensure the font sizes and ratios remain the same so there is consistency across Maternity Voices Partnerships with the National Maternity Voices brand. You may update the accent colour (purple) if desired (see Kingston example above). 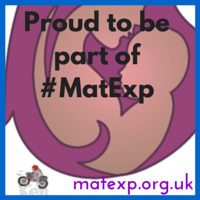 If you don’t have any graphic design skills then we can create a local version of the Maternity Voices logo for you. Please fill in your details below and submit.